After a 71-64 loss to Illinois (7-15, 3-8 Big Ten) on the road Saturday afternoon, Nebraska has dropped from its 11-2 start to 13-9 and 3-8 in conference play. The loss marks five straight — the seventh five-game losing streak in Tim Miles’ seven seasons at Nebraska. There’s no good way to spin this one. 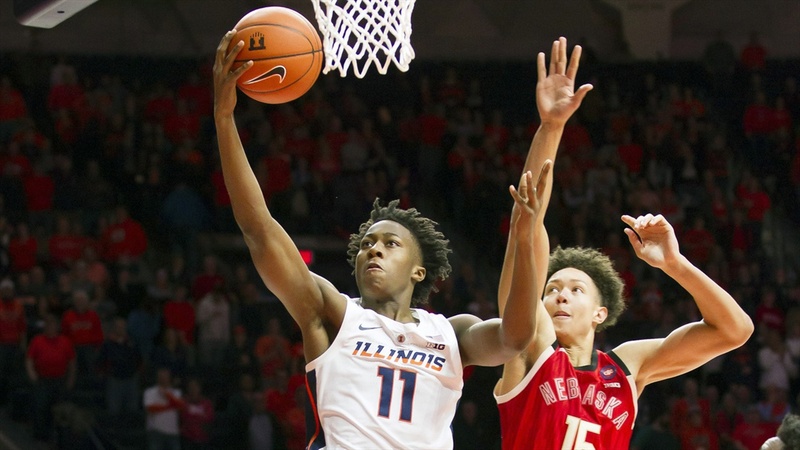 Redshirt junior forward Kipper Nichols hadn’t scored in five straight games for Illinois. He hadn’t hit double-digits since Dec. 15. He finished with 18 points on 7-of-8 shooting. Nebraska became a “get back on the right track” game of sorts for Illinois. Who would have seen that coming a month ago? Illinois entered Saturday’s game 6-15 on the season. In his short two-year tenure at Illinois so far, head coach Brad Underwood had a 6-22 record in Big Ten games. They were 2-8 in league play this season. Illinois, regardless of how much better they have looked over their last three games (two wins), is a bad team. Sitting at No. 110 in the NET ranking, the RPI replacement for the NCAA Tournament selection committee this season, a loss for the Huskers will be categorized as a Quad 2 loss. It’s Nebraska’s third Q2 loss in conference play; they’ve played three Q2 conference games. In total, the Huskers are 2-6 in Q1 games and 3-3 in Q2 games (not a tournament résumé on its own merit) but they’re 1-8 in Q1 and Q2 Big Ten games. With this stretch — seven losses in the last nine games — Nebraska has gone from a virtual lock to make the tournament to a squad that can’t even see the bubble. And no part of their recent play suggests any ability to turn it around. At this point last season, Hail Varsity started a recurring look at Nebraska’s tournament chances and what needed to happen for them to get to the Big Dance. We weren’t supposed to need that this season. And we don’t, but not for the reason anyone expected. Forward Isaac Copeland meant a lot. He was the second-leading scorer for the Huskers. Fifteen points a night is hard to lose on the fly. But losing one player, regardless of how good, shouldn’t do this to an offense. There’s no movement at all for Nebraska in that clip, and you could have said that for a large percentage of the game Saturday. So does it come as a surprise to read the Huskers shot 36 percent from the field and 13 percent from distance? The shooting from the field was the fourth game under 40 percent in the last five games. The 3-point shooting was the worst mark of the season. Nebraska took 21 free throws and only made 11. The Huskers weren’t just under a point per possession again Saturday, they were under .900 points per possession for almost the entire game. If a team holds its opponent to a point a possession, the coach is feeling good about his defense. Nebraska hasn’t been above a point per in five games. Losing a strong iso scorer like Copeland, if adjusted for properly, should have the reverse effect on an offense. There should be more movement, more passing, more effort to try and move the defense around to create openings or missed assignments to compensate for the lack of a guy who can create for himself. Instead, the Huskers have resorted to over-dribbling, aimless passing around the perimeter and zero cutting. James Palmer Jr. (22 points on 6-of-20 shooting, eight boards) was doing well early on moving without the basketball but he was the only one. Thomas Allen Jr. (11 points on 5-of-12 shooting, four turnovers) looked unsure of when to assert himself, Isaiah Roby (nine points, 3-of-11 shooting) looked like he didn’t know what he was supposed to do and Glynn Watson Jr. looked afraid to do anything. Starting five-man Tanner Borchardt was the best offensive player for Nebraska with 12 points and 18 rebounds (his first career double-double). It seems like every game I’m writing about Nebraska’s offensive issues, then the team talks about correcting them in between games, then the offense looks worse the next time out. So, apologies for getting repetitive, but it’s getting borderline unfathomable. It was a must-win game for Nebraska. Most from here on out will be. And once again the Husker bench got blasted, this time 36-4 by Illinois. The bench has 20 points in the last five games. Miles has inserted Thorir Thorbjarnarson and Amir Harris back into things (somewhat) at the expense of Nana Akenten. He has mixed up his lineups and the result remains unchanged. The scoring burden falls on the starting five. Watson is one of those five. And as the point guard, he’s as responsible as anyone for getting the offense into a rhythm. Here’s the senior’s final line against the Illini: six points, 3-of-12 from the field, 0-6 from deep, two rebounds, one turnover, zero assists, five fouls and one technical. Saturday was his first game without an assist since Nov. 16, 2017. Nebraska’s lack of ball movement is somewhat on him. As the point guard, he has to do a better job of running things. And he has to find better shots within the flow of an offensive set. Launching fallaway triples off screens is not a good look for anyone.